Our best selling product. 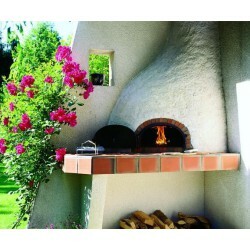 Wood fired oven to bake pizza, or for charcoal-broiled steaks or to bake pie. 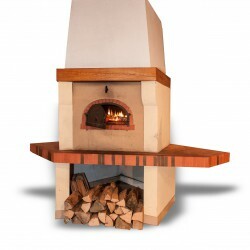 Thickness 8 cm, this oven will allow you to bake or simmer . The baker's bricks on the floor 18*18*3.7 cm are removable in case of wear or after an intensive use . Interior of the vault : Chamotte or Brick, floor and arch made of bricks. 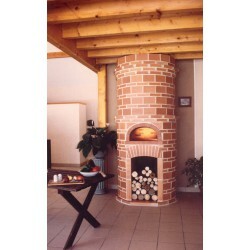 oven, cast iron door, 155 mm diameter flue connector with a damper, refractory insulating door, insulation (floor and vault ) and vault thermometer. (*) : The warranty is extended to parts for domestic ovens and only valid for family or household use within the EU, Norway or Switzerland.